Low copy number (CN) of the Fc gamma receptor 3B (FCGR3B) gene has been associated with systemic autoimmune disease. This receptor for IgG is present almost exclusively on neutrophils and plays a role in their interaction with immune complexes. At present the relationship between FCGR3B and rheumatoid arthritis (RA) is unclear. The aim of the present study was to investigate whether low CN of the FCGR3B gene is associated with susceptibility to RA. The FCGR3B CN was determined using a custom Taqman® CN assay (Hs04211858; Applied Biosystems, Foster City, CA, USA) in 197 RA patients, recruited from a tertiary setting, and in 162 population matched controls. Odds ratios for low CN (< 2) and high CN (> 2), both relative to the normal diploid 2CN, were estimated by logistic regression. A significant association between RA and low FCGR3B CN was observed, with frequencies of 13.7% in RA patients compared with 6.2% in controls (odds ratio 2.5, 95% confidence interval 1.2 to 5.4, P = 0.017). No association was observed between low CN and the presence of rheumatoid factor, anti-cyclic citrullinated peptide antibodies or radiographic erosions in RA patients. A meta-analysis including six previous studies confirmed an association between RA and low FCGR3B CN (odds ratio 1.47, 95% confidence interval 1.13 to 1.92, P = 0.004). The present study confirms that a low CN of the FCGR3B gene is associated with susceptibility to RA. The association may be stronger in patients recruited from a tertiary setting, which may relate to disease severity and/or complications. The mechanism of susceptibility remains unclear and further study is required. Variation in the copy number (CN) of genes within the human genome is an important source of genetic variation, and is defined as a sequence of DNA > 1 kb present in altered CN when compared with a reference genome . In the diploid human genome, autosomal genes are normally present in two copies (one on each chromosome). When copy number variation (CNV) is present, however, the number of copies can vary from zero to greater than two. Studies have demonstrated a large number of genes within the human genome that display CNV in a relatively high frequency. CNV may be a major source of quantitative variation in expression, and has been proposed to contribute to phenotypic diversity and disease susceptibility [2–4]. There are increasing reports of associations between CNV of certain genes, coding for various components of the immune system, and autoimmune diseases such as Crohn's disease , rheumatoid arthritis (RA) , systemic lupus erythematosis (SLE) , Sjögren's syndrome , and psoriasis . Fc gamma receptors are present predominantly on myeloid cells and interact with the Fc portion of the IgG molecule. They can be either stimulatory or inhibitory and play an integral role in the identification and destruction of both endogenous and foreign opsonised material. A number of subtypes have been identified with extensive structural diversity leading to differences in binding capacity, signal transduction pathways and cell-type surface expression . The Fc gamma receptor 3B (FCGR3B) gene is a stimulatory receptor that is present almost exclusively on the surface of neutrophils. Its precise function in the immune system remains to be clarified but there is accumulating evidence that it plays a role in the interaction between immune complexes and neutrophils [11–13]. CNV has been well characterised in the Fc gamma receptor region (Chr 1q23-24) , and a low CN of FCGR3B has been associated with SLE and Sjögren's syndrome [7, 15, 16] as well as with RA . The evidence to date for an association between low CN and RA has been contradictory, with studies showing both the presence and absence of a significant relationship [15, 17, 18]. The aim of our study was to determine whether there is an association between CN of the FCGR3B gene and RA, compared with population controls. The identification of such a relationship and confirmation of a low CN of FCGR3B as a susceptibility factor would contribute to our evolving understanding of the pathogenesis of RA. The study sample included 197 patients recruited from the rheumatology outpatient services at The Queen Elizabeth Hospital and the Royal Adelaide Hospital, two tertiary-level hospitals in South Australia. All subjects had been diagnosed with RA according to the 1987 American College of Rheumatology criteria for RA . Recruitment of patients and DNA extraction occurred over the period of 2006 to 2011. Clinical characteristics including gender, rheumatoid factor (RF) and anti-cyclic citrullinated peptide (anti-CCP) antibody status and the presence or absence of erosive disease were collected. The presence of erosive disease was defined on the basis of radiographs, formally reported by a radiologist, showing evidence of erosions, at any articular site, consistent with a diagnosis of RA. The designation of no erosive disease required formal bilateral hand and feet radiographs reported as showing no evidence of erosions. Adequate radiographic data were available in 139 patients (71%). The control group included 162 population-based Caucasian healthy subjects (53% female, median age 56 years). The study was conducted in accordance with the Declaration of Helsinki and approved by the Central North Adelaide Health Service Ethics of Human Research Committee. All participants provided informed, written consent. The FCGR3B CN was determined from genomic DNA using a custom Taqman® CN real-time, quantitative PCR assay (Hs04211858, FAM-MGB dual-labelled probe; Applied Biosystems, Foster City, CA, USA) with RNase P (4403326, VIC-TAMRA dual-labelled probe; Applied Biosystems) as the reference assay, performed as a duplex reaction. The assay was performed according to the manufacturer's instructions and quantitative PCR reactions were run on an Applied Biosystems 7300 Real Time PCR machine. All samples were tested in triplicate, and fluorescence signals were normalised to ROX. The TaqMan® quantitative PCR assay was initially validated against an alternative, end-point PCR paralogue ratio (single primer pair) assay, which estimates FCGR2C CN relative to FCGR2A, as previously described . The rationale for this is that several studies have reported complete agreement (that is, linkage disequilibrium) between FCGR2C CN and FCGR3B CN [14, 16]. The amount of PCR product corresponding to each gene was quantified by measuring respective peak heights in the QIAxel capillary electrophoresis system (Qiagen, Hilden, Germany), and CN assignments were performed following cluster analysis of the log ratio of the peak heights. We tested 100 samples in parallel, and following independent analysis there was complete concordance in CN assignment for 99 of these samples; for the remaining sample, CN could not be unequivocally assigned by the paralogue ratio assay results, and was not retested. The TaqMan® assay quantitative PCR amplification curves were analysed using three different quantitation points (Cq): Ct (autobaseline), 0.2 cycle threshold, as recommended by the manufacturer); Cy0, determined from a five-parameter log-logistic curve analysis from the ΔRn data ; and CpD1, derived from a six-parameter log-logistic curve (which explicitly models the baseline) from the Rn data. Cy0 and CpD1 estimates were obtained using the R project statistical computing qpcR library [21, 22]. Analysis was performed on a plate-by plate basis, and the CN was assigned from the raw Cq values using CopyCaller™ software (version 1.0; Applied Biosystems). This software employs a clustering algorithm and assigns the cluster with the most samples as 2CN. Reference samples of 1CN, 2CN and 3CN (validated using the paralogue ratio assay) were included on each plate to ensure that the most frequent CN categories were represented on each plate, and to confirm consistency in correct CN assignment between plates. The CopyCaller™ software also provides extensive diagnostics for the validity of the results, which were accepted only when confidence in discrete CN assignment was > 80%, the standard deviation of the sample replicate ΔCq estimates was < 0.20, and a reference gene Cq was < 32. CN assignment for results that failed any of these criteria was unequivocally resolved by retesting. Although different, all three Cq estimates gave discrete and identical CN assignments. An occasional spuriously high CN (> 5) result was obtained via the recommended Ct method however, due to sporadic FAM auto-baselining problems. We observed no discrepancies with the Cy0 method. 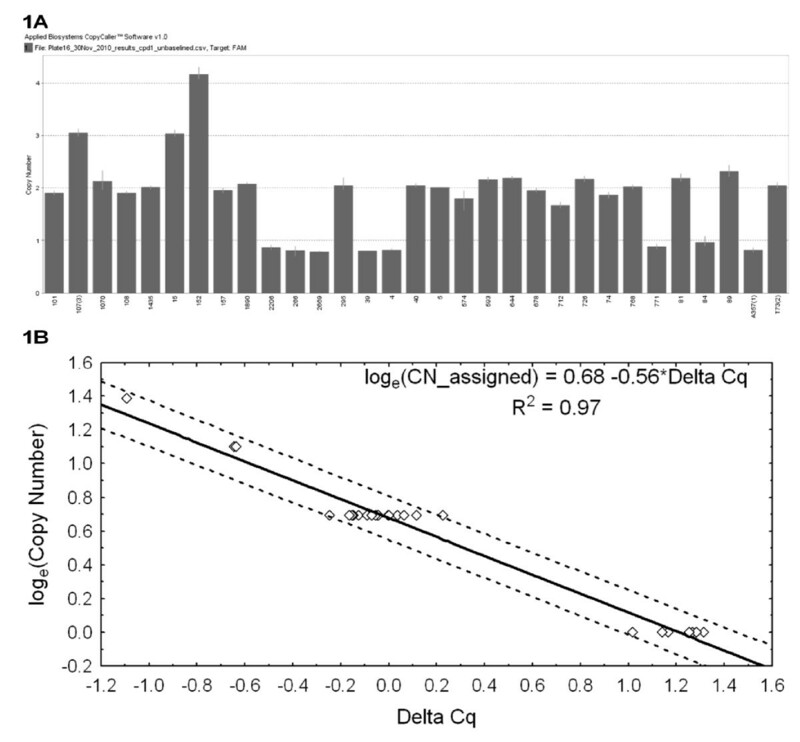 This method has been reported to overcome quantitation inaccuracy in the presence of amplification inhibition  so it is therefore unlikely that variability in DNA quality was a confounder in CN assignment, as has been previously reported . The CpD1 estimate (from unbaselined data) consistently resulted in the lowest standard deviation for replicate ΔCq estimates. Interestingly, the CpD1 estimate from baselined data did not perform well in terms of discrete CN assignments (nor did the CpD2 estimate from either baselined or unbaselined data). Both baselining and Cq estimation algorithms, which differ between instrumentation and are generally not reported, can therefore substantially influence the performance of the assay. Overall, our methodology resulted in clear assignment of a discrete FCGR3B CN to each sample, as is evident from the results for a sample plate depicted in Figure 1. Analysis summary for a typical TaqMan ® Fc gamma receptor 3B copy number assay plate. Analysis summary for a typical TaqMan® Fc gamma receptor 3B (FCGR3B) gene copy number (CN) assay plate with one, two, three, and four CN samples using CpD1 quantitation point (Cq) estimates. (A) Bar chart output from the CopyCaller™ analysis software demonstrating that the continuous estimated CN ratios for each sample form distinct clusters with values that are very close to integer values. Three reference samples are included on the plate. The 3CN reference sample is second from the left, and the 1CN and 2CN reference samples are the second last and last (right), respectively. The overall estimate of the standard deviation for replicate ΔCq values for this plate was 0.07. (B) Scatter plot of the ΔCq values versus the (natural) log of the assigned CN. The straight line represents the fitted regression line and the dotted lines represent the 95% prediction intervals for the regression. The intercept term for the regression analysis may vary between plates due to small differences in the pipetting of reagents. CN assignment must therefore be performed on an individual plate basis. The distributions of FCGR3B CN between patients and controls and between patients with and without RF, anti-CCP and radiographic erosions were compared using the maximum likelihood chi-square test with two degrees of freedom. Logistic regression analysis was used to calculate odds ratios (ORs) for low CN (< 2) and high CN (> 2), both relative to the normal diploid 2CN for RA patients compared with controls. P < 0.05 was considered statistically significant. Analysis was performed using Statistica version 6 (Statsoft, Tulsa, OK, USA). A random-effects meta-analysis of previously published studies examining the relationship between low CN of FCGR3B and RA was performed using the R metafor library [21, 23] and the restricted maximum-likelihood method. Of the 197 RA patients, 145 (74%) were female. Of those for whom autoantibody status was determined, 136 (75%) were RF-positive and 68 (60%) were anti-CCP-positive. Of those with adequate radiographic data, 96 (69%) had erosive disease. The majority of patients in both groups had two copies of the FCGR3B gene (75.6% in the RA cohort and 85.8% in the controls). A higher frequency of low FCGR3B CN (< 2) was observed in the RA patients compared with controls (13.7% and 6.2%, respectively), with OR 2.5 (95% confidence interval 1.2 to 5.4, P = 0.017) indicating an increased susceptibility for RA being associated with a low CN. No significant difference was seen in the frequency of high CN (> 2) between RA patients and controls (10.7% and 8%, respectively; OR 1.5, 95% confidence interval 0.7 to 3.1, P = 0.27) (Table 1). Data presented as n (%). CI, confidence interval; CN, copy number; FCGR3B, Fc gamma receptor 3B; RA, rheumatoid arthritis. No significant relationships were observed between FCGR3B CN and RF, anti-CCP antibodies (Table 2) or radiographic erosions (data not shown) within RA patients. Comparative frequency of Fc gamma receptor 3B (FCGR3B) copy number (CN) variants in rheumatoid arthritis patients positive and negative for rheumatoid factor and anti-cyclic citrullinated peptide (anti-CCP) autoantibodies. Data presented as n (%). An update of the meta-analysis for the association of low FCGR3B CN (< 2) with RA, originally reported by McKinney and colleagues , was also performed, which included two subsequently published studies [15, 18] in addition to the current study. The meta-analysis now includes data from seven RA cohorts, predominantly of Northern European Caucasians, totalling 2,475 RA patients and 2,320 controls. This meta-analysis confirms that low FCGR3B CN is a risk factor for RA (OR 1.47, 95% confidence interval 1.13 to 1.92, P = 0.004, random-effects estimate), even though many individual studies failed to reach statistical significance (Figure 2). Further, the I2 value of 26% indicates that the studies are relatively homogeneous. Association of low Fc gamma receptor 3B copy number with rheumatoid arthritis. Random effects (RE) meta-analysis of the association of low Fc gamma receptor 3B (FCGR3B) copy number (CN < 2) versus FCGR3B CN ≥ 2 with rheumatoid arthritis (RA). CI, confidence interval; NZ, New Zealand; OR, odds ratio. Low FCGR3B CN, while best characterised in SLE, has been associated with a range of systemic autoimmune diseases . In our study we have demonstrated a significant association between low CN of the FCGR3B gene and RA. Further, we have confirmed this association with a meta-analysis that includes seven published patient cohorts; while the association is relatively modest and somewhat less than that reported for SLE (OR 1.47, 95% confidence interval 1.13 to 1.92), it is highly significant (P = 0.004). This relatively modest effect size may explain why individual, smaller studies have reported inconsistent results. We observed a relatively high effect size in our study. Our RA patients were recruited from rheumatology outpatient services in two large metropolitan tertiary centres, and therefore our cohort may be biased towards a more severe, or refractory, disease phenotype, which is reflected in the high incidence of seropositivity and erosive disease. However, the association between low FCGR3B CN and disease severity, or response to therapy, remains to be evaluated. Only one previous study has examined the relationship between seropositivity and FCGR3B CN. McKinney and colleagues observed a higher frequency of low CN in RF-negative patients, but this was not observed in all cohorts. The anti-CCP status was available in only one cohort and its relationship with CN was not analysed . In our patient group, we found no evidence for an association between FCGR3B low CN and RF or anti-CCP status nor the presence of erosive disease. If the presence of a low FCGR3B CN increases the susceptibility to RA then the function of this receptor and how a low CN predisposes to the development of autoimmune disease needs to be considered. Fc gamma receptors can be either stimulatory or inhibitory in terms of the effect the binding of IgG has on the effector cell. FCGR3B is a stimulatory receptor that is located predominately on the cell surface of neutrophils . The function of FCGR3B in the immune response has been studied by a number of groups, with all evidence suggesting this receptor plays a role in the interaction between neutrophils and immune complexes [11, 12]. Would a low genomic CN of the FCGR3B gene have an effect on this? Willcocks and colleagues demonstrated a clear correlation between CN and FCGR3B cell surface expression, neutrophil adherence to IgG-coated surfaces and immune complex uptake , suggesting that low CN of the FCGR3B gene has physiological implications in the neutrophil-immune complex interaction. If FCGR3B plays a role in the adherence of neutrophils to immune complexes and their subsequent clearance, then by what mechanism could a reduced CN predispose to autoimmune disease? It is possible that persistent immune complexes, due to ineffective clearance, have the potential for promoting or exacerbating autoimmunity. The lack of an association between low FCGR3B CN and RF or anti-CCP in RA patients, however, suggests that this potentially impaired interaction may not specifically involve autoantigen-immune complexes. Another possibility is that an impaired response to an infectious agent and delayed clearance could promote the breakdown of self-tolerance and the subsequent development of autoimmunity. There is some evidence of a relationship between FCGR3B and susceptibility to infection to support this theory, but the data are contradictory [16, 24–26]. A reduction in FCGR3B density on the surface of neutrophils could disturb a delicate balance with the subsequent dominance of other Fc gamma receptors with greater stimulatory activity and potential pathogenicity. A study by Tsuboi and colleagues examined and compared the function of FCGR2A and FCGR3B, both stimulatory Fc gamma receptors . Transgenic mice expressing human FCGR2A and/or FCGR3B on neutrophils were challenged with immune complexes. Compared with neutrophils expressing FCGR3B, neutrophils expressing FCGR2A demonstrated significantly greater adhesion to immune complexes and release of reactive oxygen species. The mice with neutrophils expressing FCGR2A developed an autoimmune nephritis with the accumulation of glomerular neutrophils, interstitial macrophages and CD4+ T cells, the development of renal dysfunction and death. Clinical evidence of renal disease was absent in FCGR3B-deficient mice, with histology showing the accumulation of glomerular neutrophils with minimal interstitial leukocytic infiltrate and no evidence of renal injury. These results suggest that FCGR3B acts as a benign immune complex clearance mechanism and that reduced expression may lead to increased FCGR2A-immune complex interaction and thus promote immune complex-mediated tissue damage. Further support for this theory comes from evidence that immune complexes containing citrullinated proteins are potent stimulators of TNF production by macrophages via FCGR2A and are critical for the development of immune-complex-mediated inflammatory arthritis in murine models [28–30]. A final possibility is that FCGR3B CN is in linkage disequilibrium with another functional variant in the Fc gamma receptor region. For example, FCGR3B is adjacent to FCGR2C and the CNV of these two genes is in complete linkage disequilibrium . In the present study we have demonstrated that a low CN of the FCGR3B gene is associated with RA. This raises the question of what role a low CN may play in the disease phenotype. The fact that we were able to demonstrate a significant relationship in our cohort of patients from a tertiary referral centre suggests that low CN may be associated with more severe or refractory disease. Future research should explore these relationships further as well as consider whether low FCGR3B CN increases the risk of infection in the context of immunosuppressive disease-modifying therapy. While previous studies have reported inconsistent results, the present study finds that a low CN of the FCGR3B gene is associated with susceptibility to RA. The mechanism of this increased susceptibility remains unclear, although there are a number of potential possibilities based upon the growing understanding of the function of the FCGR3B receptor. Such knowledge could potentially contribute to our understanding of the complex pathogenesis of RA. The authors gratefully acknowledge the support of the patients who participated in this study, Arthritis Australia, and the Hospital Research Foundation. SWG participated in the acquisition of data, interpretation of results and review of the literature, and drafted the manuscript. SL participated in the design and coordination of the study, acquisition of data and interpretation of results, and assisted with drafting the manuscript. HN participated in the design and coordination of the study and the acquisition of data. CLH, SP and AL participated in the acquisition of clinical samples and clinical data and assisted with drafting the manuscript. MR conceived of the study and participated in its design and coordination and assisted with the acquisition of data. All authors read and approved the final manuscript.